I was a geek growing up. A black geek. Science Fiction and Fantasy fan? Check yes. Alternative/avant garde/world/ambient music fan? Check yes yes yes. I didn’t fit in. Square peg, etc. But there’s a unique issue faced when you’re a geek and of African American descent. You’re an anomaly, an outcast, the punchline of the end of a joke. See: Urkel, Stephen Q. You get funny looks at SF conventions. The record-store clerk asks you if you need help, because you are obviously in the wrong section of store. (In my case, the Import section). Your black peers also think you’re strange. If you read at all, you should read ONLY The Autobiography of Malcolm X or Makes Me Wanna Holler. Don’t get me started in music. Siouxsie, Liz Fraser and Lisa Gerrard sang the soundtrack of my late teens. Thank God(dess) that those Tower Record bags weren’t see-through! Now, it seems that there are more Afro-eccentrics out there than before. 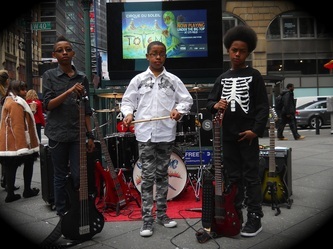 Music has Cold Specks (gothic tinged gospel), Janelle Monae (SF and Kate Bush and funk are influences) and now a heavy metal band of African American preteens called Unlocking The Truth and much more. We’re coming. We’re here.We’re frightening the horses, shaking the foundations and laying down our roots. There’s a damn pop culture Renaissance going on! This the Age of Afrogeekdom.